Don't fall into the Halloween-treat trap! Stay out of the candy bowl and try these 5 recipes. They're seasonal and fun, but they also have the extra bonus of being healthy-diet friendly! It's not hard to pack on an extra 10 pounds during the fall and holiday season. Halloween candy, Thanksgiving stuffing, Christmas mashed potatoes, and bottles of wine aren't exactly the right ingredients for a shredded six-pack. And once you start—"Another Twix? Don't mind if I do? "—it's easy to shrug off your diet plans and settle into an "I'll start up after the holidays" mindset. With this in mind, those who are careful about what they eat can feel more anxious than excited about October, November, and December. Fortunately, with the right tweaks to traditional treats, you can still enjoy seasonal food. These fun Halloween recipes will bring back childhood memories without the haunting guilt of added sugar and saturated fat. Bring them to a party, make them for your kids, or just enjoy them on your own. Either way, these recipes will certainly put you in the Halloween spirit! At this time of year, trying to forgo your cravings for chocolate may feel like mission impossible. Instead of stealing candy from your kids, whip up this low-calorie pudding as a chocolatey snack. This creamy snack is perfect for a Halloween party. Feel free to get creative with your pumpkins! 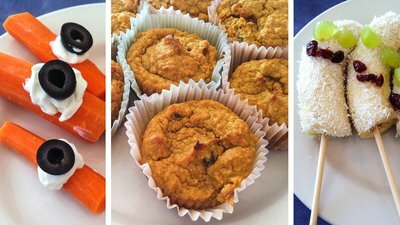 The pumpkin flavor gives these muffins the feel of the season, but the low-cal ingredients deliver solid nutrition. They're a great addition to Halloween festivities. Need a low-cal, spooky treat? Try these carrot eyes. They only take a few minutes, but everyone will love them.